Whether employers are hiring someone to make sandwiches, sell shoes, run science experiments, or repair plumbing—communication skills are always on the “must-have” list. But, what exactly do employers mean by “communication skills”, and how can you tell if you have them? 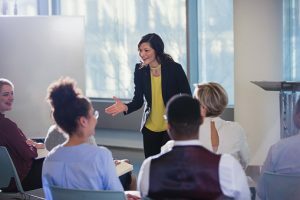 Here are some high-impact communication skills to check yourself on or work to develop, whether you’re looking for work or already have a job. Although workplace communications are often online, well-rounded communicators need to be effective in face-to-face conversation, e-mail, on the phone, and—if used by the employer—text. Communication needs vary by position, but most jobs require some face time interaction with managers, coworkers, or customers, and employers appreciate an employee’s ability to bring their A game in person. Do you greet coworkers and welcome customers? Extend a handshake at interviews and when meeting clients? Participate and stay engaged when your team is gathered for meetings or events? Customers to buy your product? Patients to understand their medication? The public to attend an event? Your manager to know you’ve accomplished your goals? Posting flyers in a neighborhood where your target customers live. Writing a fact-filled report that shows how your work performance met job goals. Creating a video that patients can re-watch, showing how to use medical equipment rather than to trying to explain complicated instructions repeatedly. Texting reminders to students to register for classes. Employers want their work teams to succeed, which typically means that team members get along, participate fully, and resolve conflicts when they do come up. The employer benefits and generally everyone on the team has a better experience. If you make assumptions about a team member, they’re probably not the most positive, while asking for clarification and clearing the air after a misunderstanding helps build trust and keep the team functioning. Do you let your team know when you need something or don’t understand something? Ask managers for feedback so you know what they need? Share information that would help others on the team? Respect shows up in what you do and what you say. Do you speak positively about others on the team? Are good manners a priority with customers and coworkers? Do you make room for other people’s ideas? In your team interactions, do you contribute to finding solutions? A team works better when members look for areas of agreement, and let unimportant differences go so the team can move forward together. Learn more about workplace skills and how your current skills relate to a possible new career, on CareerOneStop.